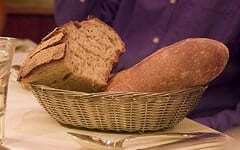 An American company has developed a technique that it says can make bread stay mould-free for 60 days. The company claims it could significantly reduce the amount of wasted bread – in the UK alone, almost a third of loaves purchased. Food waste is a massive problem in most developed countries. In the US, figures released this year suggest that the average American family throws away 40% of the food they purchase – which adds up to $165bn (£102bn) annually. Bread is a major culprit, with 32% of loaves purchased in the UK thrown out as waste when they could be eaten, according to figures from the Department for Environment, Food and Rural Affairs (Defra). One of the biggest threats to bread is mould. As loaves are usually wrapped in plastic, any water in the bread that evaporates from within is trapped and makes the surface moist. This provides excellent growing conditions forRhizopus stolonifer, the fungus that leads to mould. “We treated a slice of bread in the device, we then checked the mould that was in that bread over time against a control, ” he explained. The machine the team has built uses much the same technology as found in commercial microwaves – but with some important differences, according to Mr Stull.